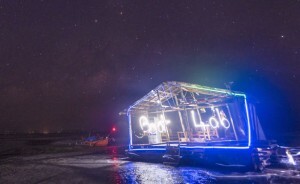 I recently got wind of “digital naturalist” Andrew Quitmeyer’s project to build a floating community hacker space in the Philippines as part of his American Arts Incubator exchange to the Philippines. Really cool stuff. Here’s the project page on the American Arts Incubator site. He also put together a great Instructables how-to based on the project and created a booklet documenting the process. He’s got some nifty publications archived on Scribd, to boot.